At Growing Room, our goal each day is to provide an enriching environment with nurturing teachers and a planned, developmentally-appropriate curriculum for Infants care 6 weeks – Preschool. Growing Room Tallahassee opened its first child development center on January 4, 2010 at 2636 Centennial Place near Capital Circle NE and Fleishmann Road. Our second center opened on August 17, 2010 at 6266 Old Water Oak Road off Thomasville Road north of Chili’s. Our third center, 1271 Metropolitan Boulevard, in the Metropolitan Center at I-10 and Thomasville Road opened on May 7, 2012. We are open Monday through Friday from 6:30 a.m. to 6:30 p.m. Growing Room Tallahassee is a franchise of Growing Room USA, the Small Business of the Year in 2004. 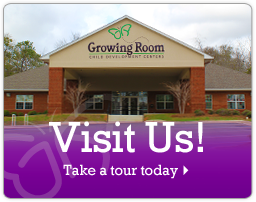 Founded in 1988 in Columbus, Georgia by Sheree Mitchell, R.N., Growing Room has a 20-year track record of raising the bar in child development and care. Growing Up on Our Block language-based curriculum that includes weekly themes based on letters, colors, concepts, skills, phonics, reading, writing, hands-on math and science, children’s literature, family style dining >and instruction in self-help, socialization and character building skills. Each infant has his or her own primary caregiver to ensure nurturing and bonding. Our Health & Safety Program was designed by founder, Sheree Mitchell, a registered nurse. A stunning, colorful environment replete with age and function specific play and learning areas within each classroom. We Are Care Givers. We Are Teachers. We Are Professionals.